Background: The diagnostic accuracy of endobronchial ultrasound-guided transbronchial needle aspiration (EBUS-TBNA) for the diagnosis of lymphoma in patients with mediastinal lymphadenopathy is not well defined. Methods: A retrospective review was performed of all patients with mediastinal lymphadenopathy referred for EBUS-TBNA between August 2005 and December 2006 in whom lymphoma was suspected based on prior history or clinical presentation. Mediastinal biopsy specimens were taken using a linear array ultrasonic bronchoscope (Olympus XBF-UC 160F) and a 22-gauge cytology needle (NA-202C Olympus) with on-site cytopathological support. The EBUS-TBNA result was compared with a reference standard of pathological tissue diagnosis or a composite of ⩾6 months of clinical follow-up with radiographic imaging. Results: Of 236 patients who underwent EBUS-TBNA, 25 were eligible for inclusion. Indications for EBUS-TBNA were suspected mediastinal recurrence of lymphoma (n = 13) and mediastinal lymphadenopathy of unknown cause (n = 12). Adequate lymph node sampling was accomplished in 24/25 patients (96%); there were no complications. EBUS-TBNA identified lymphoma in 10 patients and benign disease in 14 patients. There was one false negative EBUS-TBNA for lymphoma (lymphoma prevalence 11/25 (44%)). Follow-up over a median of 10.5 months (range 1–19) confirmed stable or regressive lymphadenopathy in all 14 patients without a lymphoma diagnosis, consistent with a benign diagnosis. Overall, EBUS-TBNA had a sensitivity of 90.9%, specificity of 100%, positive predictive value of 100% and negative predictive value of 92.9% for the diagnosis of lymphoma. Conclusions: EBUS-TBNA is an accurate, safe and useful tool in the investigation of suspected lymphoma with isolated mediastinal adenopathy, and may diminish the need for more invasive procedures such as mediastinoscopy. Lymphoma typically presents with lymphadenopathy in anatomical sites easily accessible to diagnostic biopsy or fine needle aspiration such as in the neck, axillae or inguinal regions. However, both Hodgkin’s and non-Hodgkin’s lymphoma may present with isolated mediastinal lymphadenopathy1 and, in such cases, mediastinoscopy or thoracotomy may be required to obtain diagnostic material with the attendant risk of morbidities related to anaesthesia, bleeding, infection and post-procedural pain. By integrating ultrasound technology into a flexible bronchoscope, endobronchial ultrasound (EBUS) allows accurate definition of mediastinal structures and enhances site selection for transbronchial sampling. The first device available was a radial probe introduced through the working channel of a flexible bronchoscope prior to subsequent TBNA. This marginally improved the yield of TBNA, particularly in paratracheal lymph nodes.12 However, the recent development of an integrated linear array ultrasonic bronchoscope now allows for real time ultrasonic visualisation of the needle at the area of interest with a consequent improvement in diagnostic yield to 93.5% in mediastinal or hilar lymphadenopathy among a cancer predominant population.13 The usefulness of EBUS-TBNA in lung cancer staging has been reported with a sensitivity of 92–95%14–17 but, to our knowledge, there have been no studies of the use of either TBNA or EBUS-TBNA in patients with mediastinal adenopathy secondary to lymphoma. We therefore reviewed our clinical experience to examine the clinical use of EBUS-TBNA in patients with mediastinal lymphadenopathy secondary to suspected lymphoma. Consecutive patients with mediastinal lymphadenopathy of unknown cause in whom lymphoma was suspected who were referred for EBUS-TBNA between August 2005 and December 2006 were reviewed. A suspicion of lymphoma was raised either because of a prior history of lymphoma, known lymphoma elsewhere, or because of a presentation compatible with new isolated mediastinal lymphoma based on a review of available clinical and radiographic data by the bronchoscopist performing the EBUS-TBNA procedure. An example of a compatible presentation was isolated idiopathic bulky mediastinal adenopathy with or without systemic symptoms. Patients were excluded if there was another likely cause for the lymphadenopathy suspected, such as lung cancer or other non-lymphoproliferative malignancy. Our institutional review board approved this analysis. Prior to EBUS-TBNA, patients underwent CT imaging of the thorax, with or without PET/CT scanning. PET/CT scanning was performed on an integrated scanner (Discovery ST-8, General Electric Medical Systems, Milwaukee, Wisconsin, USA) using 18-fluorodeoxyglucose (F-18 FDG). Quantification of FDG uptake within mediastinal lymph nodes was performed both visually and semi-quantitatively according to the following equation: maximum standardised uptake value (SUVmax) = mean measured activity within the volume of interest (mCi/ml)/(injected dose of FDG (mCi)/body weight (g)). For each lymph node that was subsequently aspirated by EBUS-TBNA, the diameter of the short axis of the lymph node (in mm) and the intensity of FDG uptake (SUVmax) were recorded by a diagnostic radiologist. A lymph node was considered to be FDG-avid if the intensity of FDG uptake appeared greater than that of the normal surrounding mediastinal blood pool uptake (assessed visually) and if the SUVmax was ⩾4. All of the EBUS-TBNA procedures were performed by interventional pulmonology attendances (n = 3) with or without supervised fellows. Under general anaesthesia with ventilation via a laryngeal mask airway, standard conventional flexible bronchoscopy (model BF-T160 bronchoscope, Olympus, Japan) was first performed to examine the tracheobronchial tree. A linear array ultrasonic bronchscope (Olympus XBF-UC 160F) with dedicated 22-gauge needle (NA-202C, Olympus Ltd) was subsequently used to perform ultrasonic examination and transbronchial aspiration. The regional lymph node stations of the mediastinum and hilar regions were systematically imaged and measured (diameter of short axis) using the International staging system (Mountain classification).18 All visualised lymph nodes >0.5 cm were sampled using real-time ultrasonic needle guidance. Doppler ultrasound was used to identify vessels as necessary. Each nodal station was sampled at least twice until adequate samples were attained by rapid on-site pathology evaluation (ROSE, or if an inadequate sample was initially obtained to a maximum of 5 passes per station). Specimen adequacy was defined by the presence of lymphoid tissue or tumour. Immunohistochemistry and flow cytometry were requested on all samples but actually performed on the samples at the discretion of the cytopathologist based on the cytomorphological characteristics. Adequate samples were defined as positive or negative for lymphoma. Negative samples were subdivided into benign disease, reactive hyperplasia or normal. All complications were recorded and grouped into major complications (hospital admission, respiratory failure, bleeding requiring transfusion or other intervention, pneumothorax or pneumomediastinum) and minor complications (including post-procedure cough, sore throat and bleeding <50 ml controlled with simple bronchoscopic tamponade). For the purposes of the study, a true positive diagnosis of lymphoma was made if there was a positive biopsy of lymphoma within a mediastinal lymph node, either by EBUS-TBNA or on subsequent follow-up by another modality within 6 months. A true negative diagnosis of benign disease was represented by a negative biopsy with stability or regression of lymphadenopathy documented on subsequent imaging (by CT and/or PET/CT) and by clinical follow-up over a period of at least 6 months. A diagnosis of sarcoidosis was made if EBUS-TBNA or other tissue sample identified non-caseating granulomas along with a compatible clinical phenotype and adequate exclusion of other causes for granulomatous inflammation (clinical history, follow-up and a combination of negative tissue staining for acid-fast bacilli and fungal organisms and negative respiratory fungal and mycobacterial cultures). Summary statistics were used to report the lymph node characteristics. All the statistics analysis was performed in SAS Version 9.1 (SAS Institute, Cary, NC, USA). Of 236 consecutive patients who underwent EBUS-TBNA during the study period, 25 patients with idiopathic mediastinal lymphadenopathy were eligible for inclusion in the study (table 1, fig 1). Thirteen of these patients had a previous history of lymphoma; the other 12 patients had no previous history of lymphoma but lymphoma was suspected based on radiography and clinical presentation. Figure 1 Patients suspected of having lymphoma undergoing endobronchial ultrasound-guided transbronchial needle aspiration (EBUS-TBNA). Adequate lymphoid tissue was obtained by EBUS-TBNA in 24/25 patients (96%). Forty-nine lymph nodes were sampled in total (average 1.96 per patient; table 2). Based on the results of EBUS-TBNA, other investigations and clinical follow-up, 11 patients had a final diagnosis of mediastinal lymphoma. Follow-up over a median of 10.5 months (range 1–19) confirmed stable or regressive lymphadenopathy in all 14 patients (n = 8 sarcoidosis) without a diagnosis of lymphoma, consistent with a benign diagnosis (table 1). Eight of 13 patients (61.5%) with a prior diagnosis of lymphoma were finally diagnosed with lymphoma and EBUS-TBNA was diagnostic in all. Only 3/12 patients (25%) without a prior history of lymphoma ended up with a final diagnosis of lymphoma and EBUS-TBNA was diagnostic in two and false negative in one other (described below). Of the 11 patients with a final diagnosis of lymphoma, EBUS-TBNA correctly diagnosed lymphoma in 10. There was one false negative case (described below). Of the 10 patients diagnosed with lymphoma by EBUS-TBNA, 3 patients were diagnosed with Hodgkin’s lymphoma independently by EBUS-TBNA, 1 of whom had a previous history of Hodgkin’s lymphoma (patient 8). One patient with Hodgkin’s lymphoma was initially diagnosed on EBUS-TBNA based on the cytological finding of Reed-Sternberg cells (patient 14, fig 2), but went on to undergo a medistinoscopy for further subclassification with an ultimate diagnosis of Hodgkin’s lymphoma, nodular sclerosing type. The other patient with Hodgkin’s lymphoma (patient 15) was diagnosed definitively by EBUS-TBNA and confirmed by bone marrow and endobronchial biopsies. The other 8 patients had a final diagnosis of non-Hodgkin’s lymphoma. The method of diagnosis of lymphoma by EBUS-TBNA was a combination of cytology, immunohistochemistry with and without flow cytometry in 6 and 4 patients, respectively (2 also had histological confirmation by biopsy (mediastinoscopy and endobronchial biopsy); table 1). Figure 2 Radiographic, endobronchial ultrasound (EBUS) and pathological images of a 49-year-old man with no significant past medical history who underwent endobronchial ultrasound transbronchial needle aspiration (EBUS-TBNA) for the investigation of idiopathic mediastinal lymphadenopathy. (A) Axial fused PET/CT image showing intense uptake of fluorodeoxyglucose (FDG) within the enlarged lymph nodes (stations 7 (arrow head) and 11R (arrow)), suspicious for malignancy. (B) EBUS image showing an enlarged station 7 lymph node (arrow). (C, D) Fine needle aspirate by EBUS-TBNA showing atypical lymphoid population favouring Hodgkin’s lymphoma with two Reed-Sternberg variants (C, arrows) and a multinucleated “lacunar variant” Reed-Sternberg cell (D, arrow). Stain, Diff-Quik; magnification, 400×. In the 14 patients without lymphoma, EBUS correctly diagnosed benign disease (non-caseating granuloma consistent with sarcoidosis) in 8 patients, reactive hyperplasia or normal lymphoid tissue in 5 and an inadequate sample was obtained in 1 patient (described below). The diagnostic accuracy of EBUS-TBNA in patients with suspected lymphoma was 24/25 (96%) and the sensitivity, specificity, positive and negative predictive values were 90.9%, 100%, 100% and 92.6%, respectively (table 3). Of the 25 patients who underwent EBUS-TBNA for a suspicion of lymphoma, 13 had a prior history of lymphoma. Eleven were in remission, one had an autologous bone marrow transplant 4 months previously and one had active mycosis fungoides. The mean period of remission in the 11 patients was 2.6 years and they were referred for EBUS-TBNA for new or recurrent mediastinal lymph node enlargement. EBUS-TBNA diagnosed lymphoma recurrence in 8 of these 11 patients; there was no evidence of progressive lymphadenopathy on follow-up of the other 3 patients and the EBUS-TBNA findings were considered true negative. One patient with a history of Hodgkin’s lymphoma who had received an autologous bone marrow transplant with conditioning chemotherapy (melphalan and busulphan) 4 months earlier presented with a cough and pulmonary infiltrates. The tissue sample obtained by EBUS-TBNA was inadequate owing to a dense fibrous capsule surrounding the lymph nodes at mediastinal stations 7 and 4R that resisted penetration with the cytology needle. A presumptive diagnosis of busulphan-induced pneumonitis was made with response to steroid treatment and stable lympadenopathy on CT scanning 8 months later. The other patient was undergoing treatment for mycosis fungoides and EBUS-TBNA identified reactive lymph node hyperplasia consistent with clinical and radiological follow-up. Twelve of the patients in the study group presented with mediastinal lymphadenopathy with no prior history of lymphoma but in whom lymphoma was suspected. EBUS-TBNA revealed the diagnosis of Hodgkin’s lymphoma in 2 patients, benign lymph node hyperplasia in 3 (transbronchial biopsies were positive for non-caseating granuloma in 1 patient) and non-caseating granuloma consistent with sarcoidosis in 6 patients. One other patient presented with right flank pain and both mediastinal and mesenteric lymphadenopathy. Both EBUS-TBNA and CT-guided biopsy of the mesenteric adenopathy were performed: although the CT-guided biopsy diagnosed mesenteric non-Hodgkin’s B cell lymphoma (largest node: 18 mm short axis diameter), EBUS-TBNA revealed normal lymphoid tissue in the mediastinum (subcarinal lymph node station 7: 16 mm short axis diameter). Two subsequent PET scans showed no FDG-avid disease in the mediastinum. The patient declined systemic chemotherapy; at 8 months of follow-up there had been a progressive increase in size in the mesenteric lymphadenopathy but, interestingly, the mediastinal lymphadenopathy had reduced in size. Despite this clear discrepancy in the clinical course of the mediastinal adenopathy, for purposes of this analysis we considered the EBUS-TBNA result as a false negative for mediastinal lymphoma. No complications were identified from the procedure or anaesthesia. All procedures were performed as outpatient cases and all patients were discharged after brief observation as per institutional protocol. 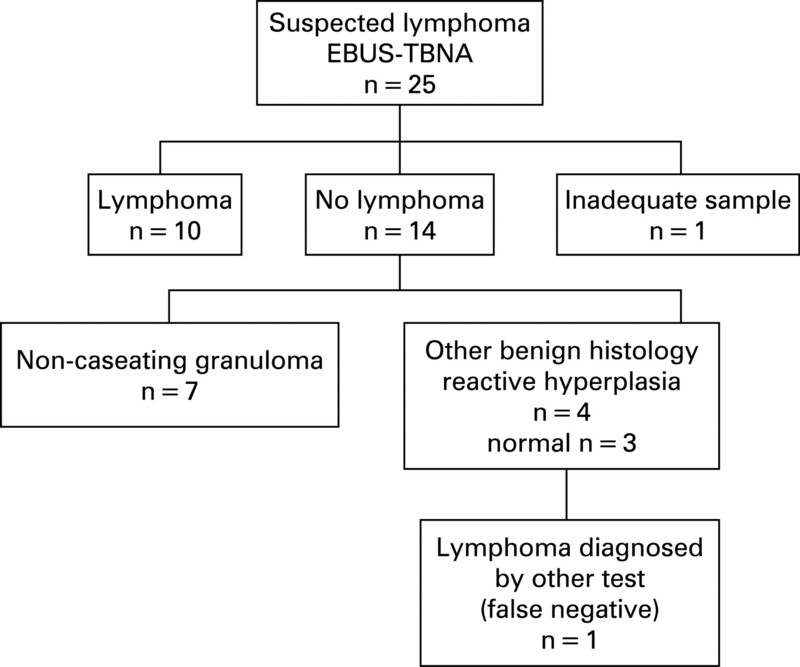 Our findings show that EBUS-TBNA is a safe and diagnostically accurate technique for the diagnosis of lymphoma in patients with mediastinal lymphadenopathy. Obtaining adequate pathological specimens is vital in the definitive diagnosis of lymphoma. In patients with mediastinal adenopathy—including those with suspected isolated mediastinal lymphoma—mediastinoscopy has been the procedure of choice to obtain tissue over the past three decades.19 However, mediastinoscopy does not allow access to perihilar lymph nodes and it is technically very difficult to repeat the mediastinoscopy on the same patient due to post-procedural fibrosis. This becomes particularly important in previously treated lymphoma patients with recurrent mediastinal adenopathy. It is also a surgical procedure with attendant risks and complications. In several large series of patients with mediastinal adenopathy undergoing lung cancer staging, definitive diagnosis by mediastinoscopy was achieved in approximately 85–95% of cases with false negatives rates of 5–8%.19–21 Significant complications occurred in 1–5%.19–21 Thus, newer less invasive methods of obtaining pathological specimens have been developed including CT-guided transthoracic needle biopsy and transbronchial and transoesophageal lymph node sampling. In contrast, the performance of endoscopic ultrasound-guided fine needle aspiration (EUS-FNA) (22 gauge needle) in one study of 23 patients in lymphoma was reported with sensitivity, specificity and accuracy of 74%, 93% and 81%.22 These authors also asserted that the addition of flow cytometry and immunohistochemistry improved the yield of EUS-FNA. A more recent study also suggested that the addition of histological sampling using a 19-gauge needle to EUS-FNA in patients with mediastinal adenopathy without ROSE improved the diagnosis of lymphoma.23 The diagnostic reach of EUS-FNA is, however, limited to retrotracheal (station 3), left lower paratracheal (station 4L), subcarinal (station 7), lower paraoesophageal (station 8) and pulmonary ligament (station 9) lymph nodes. Since the commencement of our EBUS programme we have routinely used flow cytometry and immunohistochemistry in patients with suspected lymphoma on the basis of previously published experience with EUS-FNA, and our data suggest that this is a reasonable clinical approach.22 Unlike EUS-FNA, a 19-gauge trucut biopsy needle is not currently available for real-time EBUS-TBNA and it is plausible that this additional histological sampling will improve the yield and sensitivity of EBUS-TBNA in patients with mediastinal adenopathy secondary to lymphoma. In conclusion, in patients with mediastinal adenopathy and a suspicion of lymphoma, EBUS-TBNA with flow cytometry and immunohistochemistry analysis is a safe, minimally invasive and highly accurate technique that may decrease the need for more invasive procedures such as mediastinoscopy.
. Tumors of the mediastinum. Chest 2005;128:2893–909.
. Bronchoscopic needle aspiration biopsy of paratracheal tumors. Am Rev Respir Dis 1978;118:17–21.
. Transbronchial and transoesophageal (ultrasound-guided) needle aspirations for the analysis of mediastinal lesions. Eur Respir J 2006;28:1264–75.
. Accuracy of transbronchial needle aspiration for mediastinal staging of non-small cell lung cancer: a meta-analysis. Thorax 2005;60:890–1.
. Yield of transbronchial needle aspiration in diagnosis of mediastinal lesions. Chest 2003;124:2131–5.
. Diagnostic value of transbronchial needle aspiration by Wang 22-gauge cytology needle in intrathoracic lymphadenopathy. Chest 2004;125:527–31.
. The diagnostic yield of transbronchial needle aspiration in superior vena cava syndrome. Lung Cancer 2003;42:183–8.
. Diagnostic yield of transbronchial histology needle aspiration in patients with mediastinal lymph node enlargement. Respiration 2003;70:631–5.
. Conventional transbronchial needle aspiration decreases the rate of surgical sampling of intrathoracic lymphadenopathy. Chest 2007;131:773–8.
. Underutilization of transbronchial needle aspiration: experiences of current pulmonary fellows. Chest 1997;112:251–3.
. Survey of flexible fibreoptic bronchoscopy in the United Kingdom. Eur Respir J 2002;19:458–63.
. Conventional vs endobronchial ultrasound-guided transbronchial needle aspiration: a randomized trial. Chest 2004;125:322–5.
. Real-time endobronchial ultrasound guided transbronchial needle aspiration for sampling mediastinal lymph nodes. Thorax 2006;61:795–8.
. Real-time endobronchial ultrasound-guided transbronchial needle aspiration of mediastinal and hilar lymph nodes. Chest 2004;126:122–8.
. Endobronchial ultrasound guided transbronchial needle aspiration for staging of lung cancer. Lung Cancer 2005;50:347–54.
. Endobronchial ultrasound-guided transbronchial needle aspiration of lymph nodes in the radiologically normal mediastinum. Eur Respir J 2006;28:910–4.
. Comparison of endobronchial ultrasound, positron emission tomography, and CT for lymph node staging of lung cancer. Chest 2006;130:710–8.
. Regional lymph node classification for lung cancer staging. Chest 1997;111:1718–23.
. Mediastinoscopy: its role and value today in the differential diagnosis of mediastinal pathology. Acta Oncol 2001;40:79–82.
. The current role of mediastinoscopy in the evaluation of thoracic disease. J Thorac Cardiovasc Surg 1999;118:894–9.
. Nine-year single center experience with cervical mediastinoscopy: complications and false negative rate. Ann Thorac Surg 2006;82:1185–9.
. EUS-guided fine-needle aspiration combined with flow cytometry and immunocytochemistry in the diagnosis of lymphoma. Gastrointest Endosc 2001;53:485–91.
. Advantage of EUS Trucut biopsy combined with fine-needle aspiration without immediate on-site cytopathologic examination. Gastrointest Endosc 2006;64:505–11.
. Transbronchial versus transesophageal ultrasound-guided aspiration of enlarged mediastinal lymph nodes. Am J Respir Crit Care Med 2005;171:1164–7.
. The role of mediastinoscopy in the diagnosis of mediastinal lymphadenopathy. Eur J Cardiothorac Surg 1998;13:196–9.